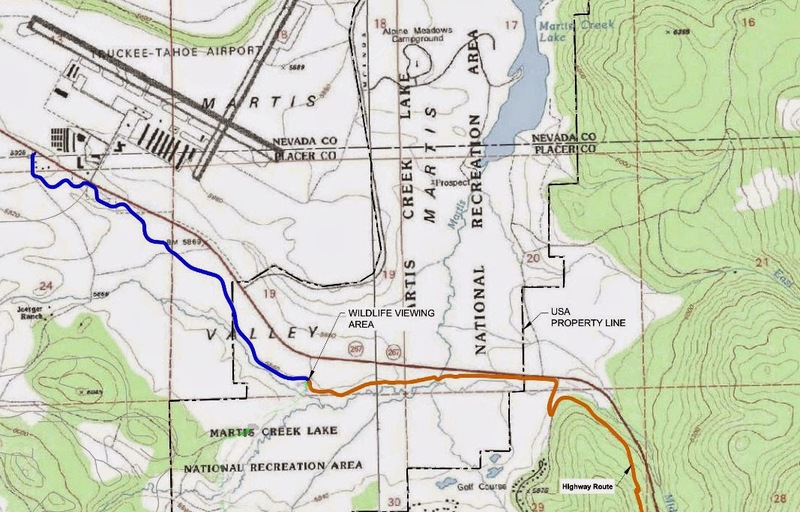 The proposed Martis Valley Trail, connecting Truckee to the North Shore has been in the planning stages for years. In late August, the Placer County Board of Supervisors approved funding to start construction this month. First 2 sections in blue. Route continues in orange. The initial construction will be on a 0.57 mile section that parallels Hwy. 267 near the Truckee-Tahoe Airport. Additional sections will be built when funding becomes available. The entire Martis Valley Trail is expected to be just over 10 miles in length, ending at the “Four Corners” area of the paved Fiberboard Freeway. The Fiberboard Freeway is an old logging road. When the Martis Valley Trail was under consideration, two routes were proposed through Martis Valley. The less scenic route ran parallel to Hwy. 267 and the other route was around the valley near existing homes. Unfortunately the homeowners prevailed, so the trail will now run parallel to Hwy. 267 in Martis Valley. After crossing Martis Valley the trail will continue through Northstar property to Four Corners. Construction will begin this month. The second section of trail will continue out to the Martis Valley Wildlife Viewing Area for a total distance of 1.76 miles. Construction is expected on the second section in the spring of 2015.